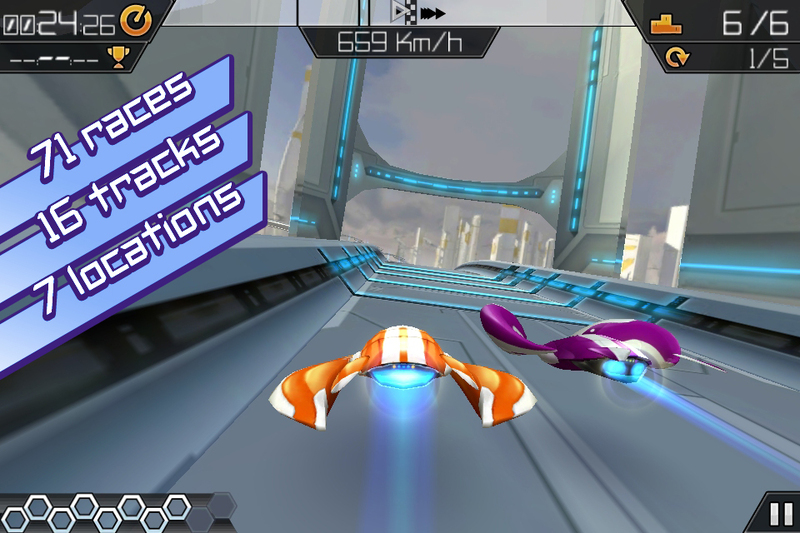 We don’t see a lot of futuristic racers on iOS, much less good ones. AXL: Full Boost ($1.99), the latest creation from the folks at SpinVector and Palzoun, looks to buck the trend with a full-featured, frenetic title that does a great job of emulating one of the most well-known high-tech racing series around. While its mandatory tilt controls take some of the fun out of the title, AXL: Full Boost still has enough going for it to be an enjoyable experience. AXL follows the standard formula for most racers. The game consists of several divisions of varying difficulty, and within each division are groups of specific races that built around the amount of racers, number of laps, and whether power-ups are active or not. Each race awards ‘fame points,’ which unlock more tracks, racers, and divisions. Meanwhile, racers are scored on three different stats: speed, maneuverability, and energy. If you’ve ever played the Wipeout series, AXL’s presentation and feel are going to seem very familiar. The introductory cutscenes, navigation menus, environments and even the vehicles all share that same futuristic motif that’s been made popular in Wipeout. That’s not to say that AXL doesn’t emulate the theme well – in fact, I was pretty impressed at how it managed to recreate some of the fast-paced fun of Wipeout. Thankfully, AXL goes a bit beyond simple imitation and adds a few twists to the formula. As you might imagine, AXL: Full Boost’s primary emphasis is on planning your boosts. In order to launch a boost, you have to temporarily break for a few seconds which allows your ship to morph into speed mode and consume your HEX energy spheres. This is an important difference simply because there’s a certain extent of planning before you boost – blindly stopping to boost whenever you get enough energy can be a bad idea, especially if you’re near the finish line or if your momentum carries you into a turn before the boost can fire. It does take getting used to compared to most other racers’ emphasis on punching it whenever you can, but I welcome the small change. Another area that feels unique to AXL is in its use of HEX spheres that act as a finite resource and are dumped back onto the racing track when you boost or use a power-up. This makes collecting resources doubly important because the more you collect and strategically use, the less your opponents have. It’s an interesting variation that actually adds some thought as to when and where you want to boost as doing it in the wrong place or time can very easily give an opponent the advantage. Unfortunately, when it comes to controls, AXL makes a few questionable choices that keep the game from being even better. For starters, the only control scheme available is tilt to steer. There are no virtual joysticks, sliders, or any other alternative. Admittedly, the tilt controls aren’t horrid, and a sensitivity slider allows you to attempt to fine-tune your turning abilities. However, there are a few reasons why this control scheme just doesn’t cut it. First, while the visuals looks decent (if a bit simplistic) and the gameplay feels very fast, it isn’t necessarily conducive to tilt controls – particularly with the quick reflexes needed to take tight turns in later courses. AXL tries to rectify this somewhat with its auto-turning mechanism that kicks in during boosts, but that feels more like a cover-up than an actual way to address the issue. Finally, unless it’s absolutely required, games should really have some sort of alternative control scheme to having to physical manipulate your device. Thankfully, control schemes can be added in future updates (which I hope they are) without significant tweaking. In any case, gamers that can tolerate (or actually like) tilt controls should definitely check out AXL: Full Boost. The presentation is top notch, there’s plenty of content and it’s the closest racer to Wipeout that I’ve played on iOS so far, which is certainly not a bad thing. If fast and frenetic racing is for you, look no further.